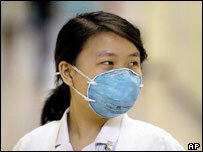 The World Health Organization has said China has contained the latest outbreak of the Sars virus. In a statement, the WHO said no new Sars infections had been reported in China for more than three weeks. The first outbreak of the pneumonia-like illness killed nearly 800 people worldwide, after it first appeared in China 18 months ago. Sars emerged again last month when two researchers at Beijing's Institute of Virology contracted the disease. The WHO said it still did not know exactly how the latest outbreak began. But it said in a statement on Wednesday that "the chain of human-to-human transmission appears to have been broken." All the nine cases in the latest outbreak can be traced back to the same Beijing laboratory, health officials have said. Sars was first reported in the southern province of Guangdong in late 2002. That outbreak killed 774 people worldwide and infected more than 8,000 others before abating in July 2003.